Over more than three decades, the need for refining and improving disability definition and measurement, and using those tools to analyse the life experiences of individuals with disability, has been advanced through international initiatives and policy documents. With respect to the former, the work of the World Health Organization in the development of the International Classification of Functioning, Disability and Health (ICF) (WHO 2001) and the formation, in 2002, of the United Nations Washington Group on Disability Statistics have been paramount. In terms of policy, the focus of the international community has been directed to issues of disability in recent decades, highlighted with the World Program of Action Concerning Disabled Persons (UN 1982; 1993), The Standard Rules on the Equalization of Opportunities for Persons with Disabilities (UN 1994) and more recently in the UN Convention on the Rights of Persons with Disabilities (Article 31) (UN 2006) and the Report by the High-Level Panel on the Post-2015 Development Agenda (Chap. 4, page 23) (UN 2013a). Estimation of disability prevalence in a population, statistics on access to basic services and descriptions of the status of living conditions are regarded as important for policy development, for planning purposes, for resource allocation, for monitoring, impact assessments and comparisons across groups, for awareness building and as a foundation for advocacy work and improved dialogue between stakeholders, including disabled people’s organisations (DPOs) and relevant national authorities (Madans et al. 2004). Reliable and valid disability statistics are seen as instrumental for monitoring the implementation of the UN Conventions, and to ensure the human rights of people with disability. This understanding has also been adopted by the international disability movement, as exemplified by the recent resolution of the International Disability Alliance supporting an inclusive post-2015 development agenda for persons with disability in Africa (point 6) (IDA 2014). 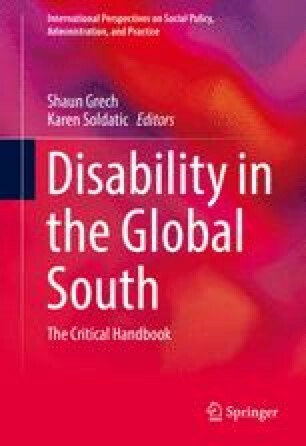 This chapter draws some historical lines to illustrate the development of the discourse on disability and uses this as a background for a critical examination of current possibilities and challenges in disability statistics. UN DISTAT. (2013). Human functioning and disability. United Nations Statistics Division. Retrieved September 25, 2014, from http://unstats.un.org/unsd/demographic/sconcerns/disability/disab2.asp. UN. (2013b). UN Millennium Development Goals. Retrieved September 26, 2014, from http://www.un.org/millenniumgoals/. United Nations Statistics Division. (2008). Principles and recommendations for population and housing censuses (2nd revision). New York: United Nations. Retrieved August 2, 2014, from http://unstats.un.org/unsd/demographic/sources/census/docs/P&R_Rev2.pdf.